We just wanted to pass on our thanks and gratitude on behalf of our patient and ourselves. This morning we fitted an immediate denture for our patient to replace her front tooth. The fit and aesthetics are superb. You continue to impress us with your beautiful prosthetic work. Just to say a thank you to your team and technician for the immediate denture. Looks lovely and fitted like a dream. The patient and I am over the moon! 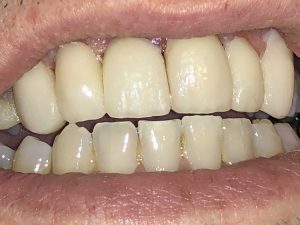 I have just fitted my first Valplast denture and I can’t speak more highly about it. The aesthetics were so impressive – it just vanished when I put it in. The fit was perfect and required no adjustments. The other thing I loved is that it was so small and discrete. HQ have been very helpful throughout and guided me through the process. I’d advise anyone to try Valplast. Just wanted to let you know that the P/P dentures fit brilliantly! You’ve done an amazing job and made the patient extremely happy. Thank you so much for taking the job on and doing it at short notice. I have found myself a new lab. I’d just like to say a particular thank you for your hard work. I’ve had some great dentures from you over the past few months, NHS and private. I had a patient who has severe learning difficulties. We made him a partial upper and it fit him so well and looked great. He was clapping with a huge smile on his face when he looked in the mirror! !